I have an MFT/3 and VL attachment. I'm wondering which is the best way to go for an accurate easily adjustable fence system. I'm looking at the Incra LS supersystem (either 17 or 25"). Or another option is to fit the CS70 LA fence with the Wixey WR700 digital readout for fence position. What are the pro's and con's of each setup? Does the CS70LA easily square to the table? How much extra room does the Incra LS extend beyond the MFT/3? I have quite a tight workshop. That can be problematic. It is designed to 'lead' material to the cutting edge of a saw, so the right distance from blade to fence at that point is what is required from the LA; and seeing that is quite common to have the fence 'bend back' a bit after the saw (to prevent backlash etc. ), one can not expect the LA to be absolutely perpendicular and parallel. I have been fiddling with my LA (that is on a VL with TS55 insert) to get it as perfect as possible, and got it within a tolerance that is acceptable to me (about 3/10 of a mm variation in a 50 cm stick). Seeing what Guy at Guy's Woodshop on YouTube does with his set up with an Incra positioner, his tolerances are a lot better than that. AS a CS70 Set owner I can confirm what Bert already said, the CS70LA does not square easily to the table. You always have to position both ends very carefully to make sure it runs straight along the saw line. That's what I feared. I hate messing about having to square up the fence on my old DeWalt before each cut. I love watching Guy's video's and had noticed he uses the Incra permanently whereas alot of other woodworkers only seem to use it for routing and just use an ordinary fence for the table saw. Given the cost of the the CS70LA fence I might save for the Incra instead and then use it as a router fence too. I have an MFT+VL and the incra fence. I use it all the time. Very accurate, repeatable and a peach to use. I worked with Jerry at Precision Dogs on the first version of the adapter plate and it makes a world of difference on the setup and breakdown. Here is a pic to help out... I use the fence for routing as well as for cutting. That looks like a nice setup. Which Incra positioner is that 17 or 25? How much does it protrude beyond the edge of the table when it is at the maximum cut width? It is a LS25. I usually mount it mid table and it doesn’t protrude off the edge but I can mount it on the “edge” and take a few shots of it later. It would be about 24” off the end to get the “full table” use of the MFT. I have the LS 25. At full extension I am approximately 4.5- 5 inches off the end of the mft. Here you go Simon. With it mounted in the last set of MFT holes, and at max cut capacity, it is about 33” from the blade/bit and hangs off the back by about 19”. Thanks for both responses, they are both useful information. I was interested that the maximum cut width can be bigger than the LS positioner length. I guess there is nothing stopping the positioner been inserted into the table and zero'd out, then moved back 1, 2, or 3 sets of dog holes if you need a bigger cut width you just need to remember to make the appropriate 1,2,3 x 96mm adjustment to whatever the positioner reads! That is correct Simon. It uses 2 holes (with one space in between. It is rock solid and very flexible! I have even moved my CMS to the wide side of the table for some tricky routing last year. Zeroing out takes all of 5 seconds and for saw operations, it can be even quicker. I love my setup, but then again it rarely needs to be transported. If it needs to be moved often, that might need a different solution. Has anyone come across a way to attach the LS rails to the MFT3, or just attach the fence itself to the rails of the MFT3? 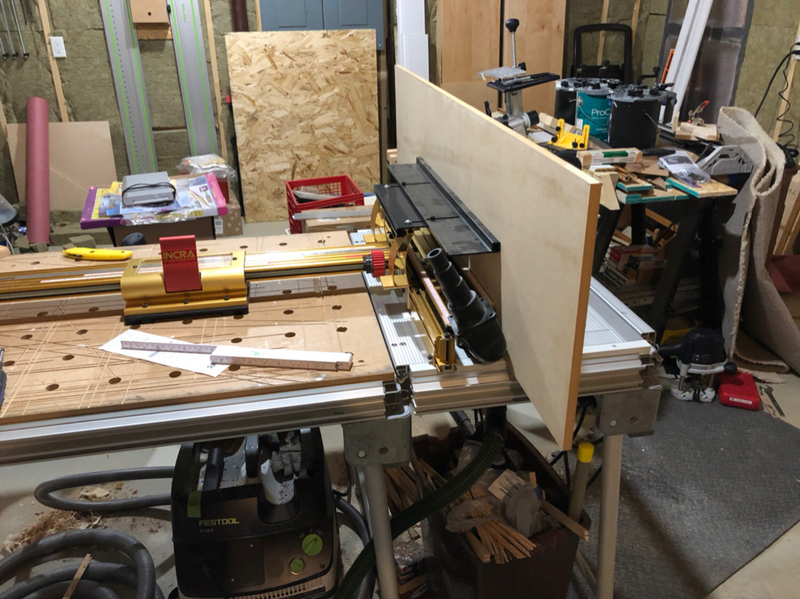 I'd really like to use the LS system as a table saw fence with the TS 75 module on the CMS VL, but I'm worried that the fence won't be rigid enough without being fixed on both sides (or at least the infeed side). There's a really old thread on this from 2010 on the FOG, where someone used the crown moulding attachment from the Kapex, rather than buying the Incra rails, but the photos are gone and it's hard to understand what the workaround actually consisted of. I'd be grateful for any suggestions. Many thanks. Domino earrings, because you're worth it. Alan. Not only do I have my router in my CMS VL, but I also have the TS 75. The fence really doesn’t deflect. At one point in time, I came up with a plan to attach the Incra to the v grooves on the MFT or CMS, but honestly, for most work, it is unnecessary. Once, I did have a very expensive piece of mahogany ply, that I put some clamps and blocks behind the fence to make it solid. I don’t think it did anything different, but it made me feel better. Here are a few pics of my setup from a pantry project I have been working on. Feel free to hit me up for more pics or details! Did you say that you keep the wonder (router) fence on all the time, even when using the saw? I guess that adds some bulk to the overall fence setup - probably a very wise idea. I'm wondering what extra bits you had to add on to make your tall (mdf) auxiliary fence? There seems to be a black plastic piece connected to what looks like a couple of incra arms? Is this an accessory you can buy or did you make it yourself? You got it! The super system comes with everything you need. I did invest in a few packs of button head Allen screws to put the tall fence for cutting the rabbets in the cabinet parts. Let me know if you need anything else. Again, I love mine and keep it in pretty constant use! Here is where I store it when not using it. One last question if I may! If the LS sits in the last row of holes and is about 33" from the blade, wouldn't the LS32 be a slightly better choice over the LS25? I have two MFT3s connected lengthways, so an LS32 at full extension will just hang over the second MFT, and not really be in the way. That way I could zero the LS and pull it straight back without any additional calculations - quite handy for things like standard 732mm (28 and 13/16 inch) cabinet heights...? I keep thinking that there must be a reason why the 17 or 25 make more sense, but maybe not? I always have time for questions! I did this dance before with the 32 v 25 and picked the 25 due to the fact it covered 95% of what I could foreseeably see doing with my setup. I had planned on using my track saw to do the cabinet box cutting if the height was too tall for my single MFT setup. I also have thought about buying another MFT. I have also planned on building my own as well, just haven’t had a pressing need to do so up to this point. I also have looked at Felder sliders over the years so as you can tell, I am all over the place! 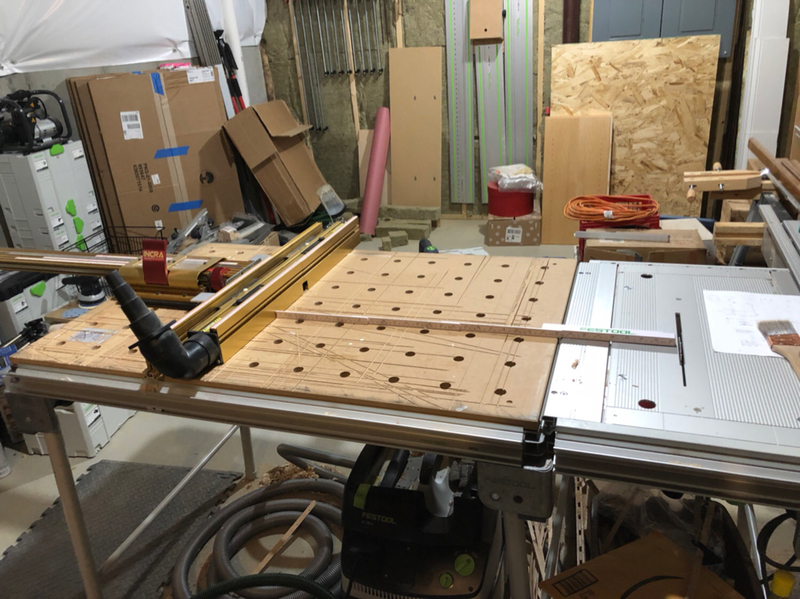 I will generally keep my Incra in the holes fairly close to the size project I am doing (usually around the middle of the table), but can move it in under 1 minute if I need a longer or shorter distance. One other note... I do use the router and table saw aspects of the fence quite often and the only on you need to “calibrate” is the fence to saw measurement. The router can be out of skew without messing things up, but a blade needs to be parallel to the fence or slightly toe’d in. Think I'll go for the 32...I'll post a pic when I get it all set up. Hi All hope this is not too far off topic ... last year I started experimenting with an idea for a portable wood shop that will break down and go into my 4X4 .... the prototype has two side by side MFT style tops with a saw and router mounted CMS style ... the tables are laid out with the Parf Guide system and dog holes added to take the Precision Dogs plate ... the LS positioner and sliding table can be used from both sides ... 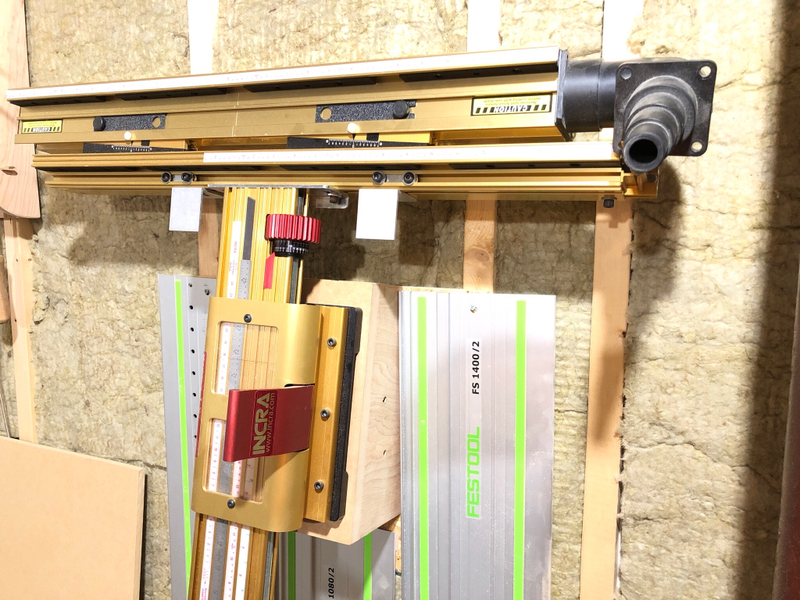 I adapted the LS positioner extension arm to lock on to the 80/20 sub frame for extra stiffness when side extensions are added ... the Parf sticks allow for super accurate calibration of the tables to each other and any added fixtures like the miter gauge ... still a lot of work to do! 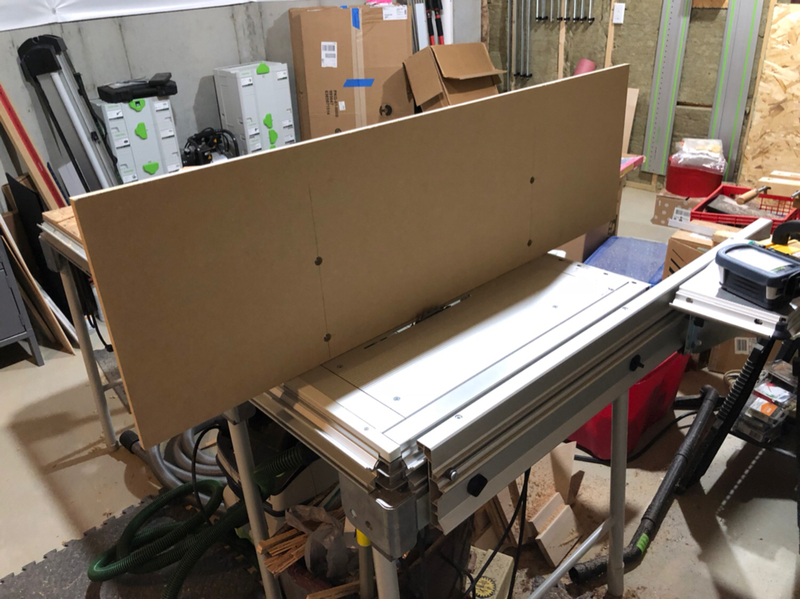 Hi All hope this not too far off topic ... last year I started experimenting with an idea for a portable wood shop that will break down and go into my 4X4 .... the prototype has two side by side MFT style tops with a saw and router mounted CMS style ... I adapted the LS positioner extension arm to lock on to the 80/20 sub frame for extra stiffness when side extensions are added ... the tables are laid out with Parf Guide system and dog holes added to take the Precision Dogs plate ... the LS positioner and sliding table can be used from both sides ... the Parf sticks allow for super accurate calibration of the tables to each other and any added fixtures like the miter gauge ... still a lot of work to do! I remember chatting with you a bit on ideas a while ago... I really like the execution mate! Lots of great ideas here. I have been thinking about a lot of next gen ideas in my setup, but have yet to pull the trigger. One of mine is to make the slider a bit better than what it does for me in its current state. I'm now owner of an Incra positioner from Woodworkers Workshop and the Precision plate from Jerry at PrecisionDogs. After abit of a delay getting the plate through customs I'm now all setup. The accuracy of the Incra is amazing. The ease of attaching and removing the precision plate is awsome. I'll try get some pictures as it was great to see other people setup for ideas/inspiration so I feel I should share mine too. I added another use for my Incra positioner today. I mounted my Bosch PBD40 into my VL extension so I can easily drill holes at a specific pattern for mounting to some predrilled aluminum plates. @msnelling I’d like to see more overall pictures of your setup. 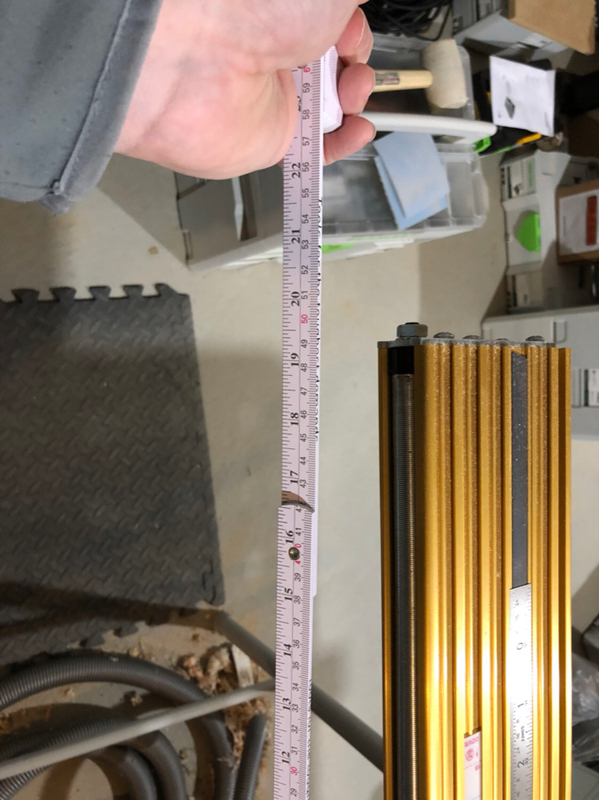 If you turned the drill press 180 degrees could you use the positioner with a full 120mm depth between the drill bit and the column? Yes, that's a good idea. Also it means the clamp still works on small pieces!